We are committed to keep your data safe; we won’t sell it to third parties; we won’t send you unwarranted emails; and we won’t keep your data any longer than is needed. At Spencer Bray, we are committed to ensuring that your privacy is protected. Whenever we ask you to provide certain information by which you can be identified, you can be assured that it will only be used in accordance with this privacy statement. We may change this policy from time to time by updating this page, which will represent the current statement of our policy at any time. When Spencer Bray collects and processes your personal data we are doing so on our own behalf, and not on behalf of any third parties. This means that Spencer Bray Limited is termed a data controller under the terms of data protection legislation. Consent – for example, where you have given your permission to receive emails. Contractual obligations – for example, where we need your data to fulfil our contract with you. Legal compliance – for example, where the law requires us to do so. which might reasonably be expected as part of running our business and which does not impact your rights, freedoms or interests. This sets out what information we collect, why it’s needed, and the legal basis for doing so. We do not sell any personal information to any third parties. If we refer you to another company, for example in the event that services are needed which are beyond the scope of those we offer, then we will always give you the contact details of the company so that you can initiate the contact or we will ask your permission for your details to be provided to that company. We will not send you unsolicited marketing material or pass your information to any companies who would do so. We’ll retain your information for as long as is necessary for the purpose for which it was collected or as is required to meet legal or regulatory requirements; resolve disputes; prevent fraud and abuse; or to enforce our terms and conditions. All data is held securely and, at the end of that retention period, your data will either be deleted completely or anonymised – for example by aggregation with other data so that it can be used in a non-identifiable way for statistical analysis and planning. You have the right to know how we process your personal data, and the right to access the information we hold about you, free of charge. You can correct personal data when incorrect, out of date or incomplete. This can be done by contacting our central administration office on 01367 241151. You can request that we delete your data, stop collecting or processing it, in some circumstances. This can be done by contacting our central administration team on 01367 240077 or contacting them online and requesting for your data to be deleted. The response to such requests will need to reflect our legal responsibilities (for example, our legal requirement to be able to respond to complaints or claims made against work carried out). We are committed, however, to look into your request and inform you of our decision within 14 days. 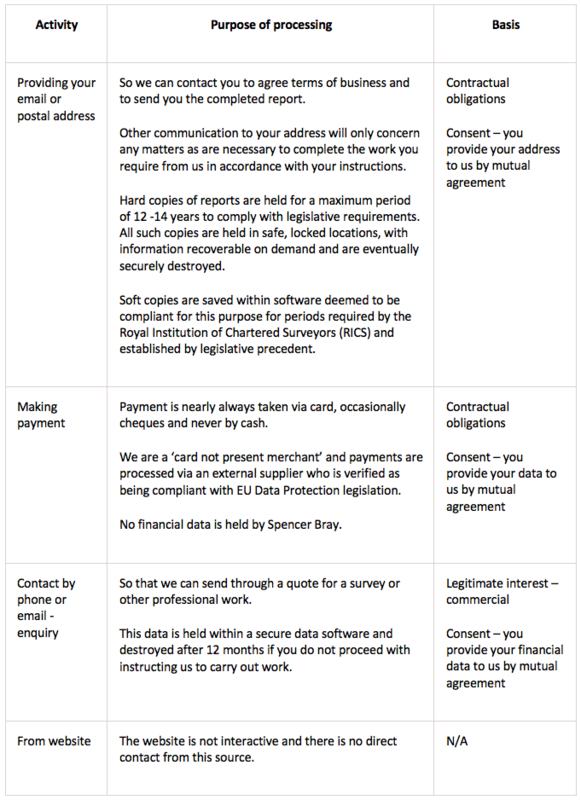 You have the right to complain to your data protection regulator – in the UK, the Information Commissioner’s Office. This policy is regularly reviewed to maintain compliance with current legislation.